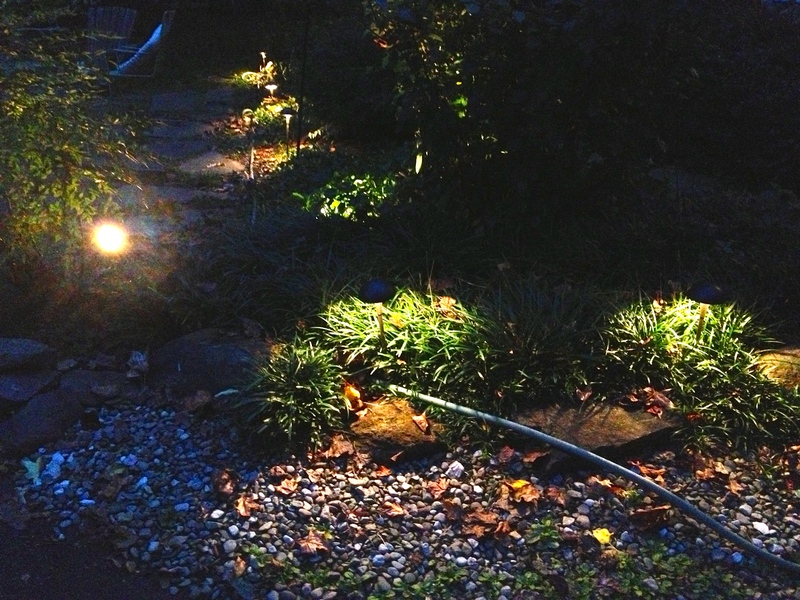 First, I took stock of the yard and determined where I wanted lights. 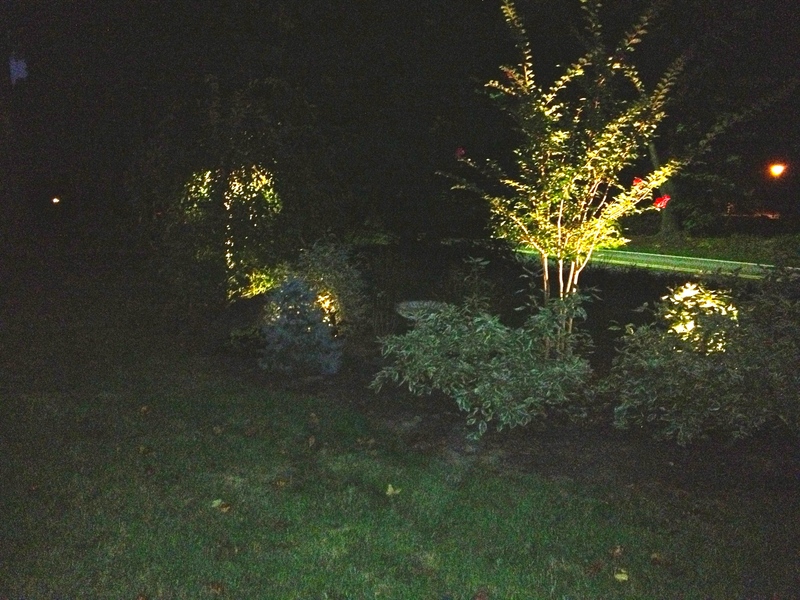 I decided to use 20 watt floodlights to highlight a few ornamental trees (a crepe myrtle and dwarf cherry blossom weeper) and 10 watt path lights to illuminate the walk and its border garden. 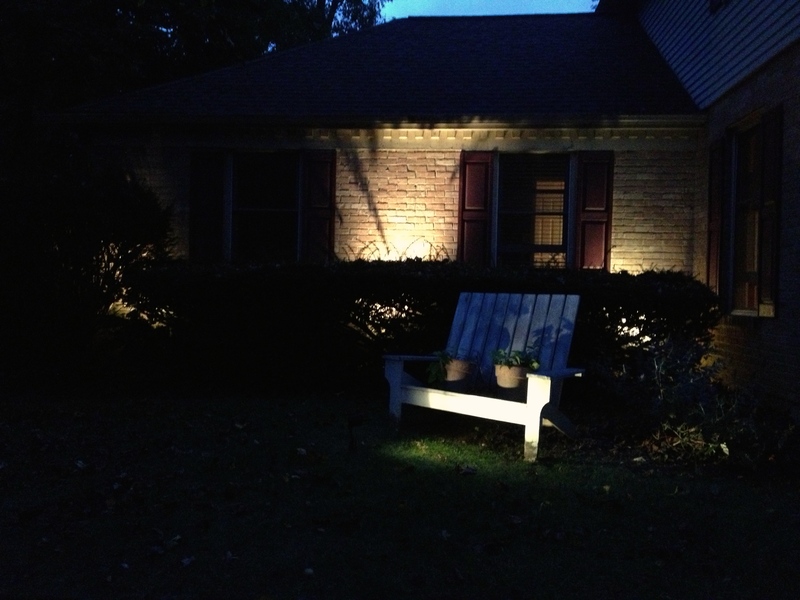 I also wanted to light the house, so I chose some 35 watt spotlights to add pools of light here and there on the exterior. Once I knew how many lights I wanted, I totaled up the voltage to determine how large the transformer needed to be. A word of warning here: double the voltage when buying your transformer. I originally chose a 300 watt transformer only to find that I liked the lighting so much that I immediately wanted to add more lights and had to buy a larger transformer. I purchased the transformer and lights individually from Lowe’s, but you could also purchase a pre-made set if you wish. 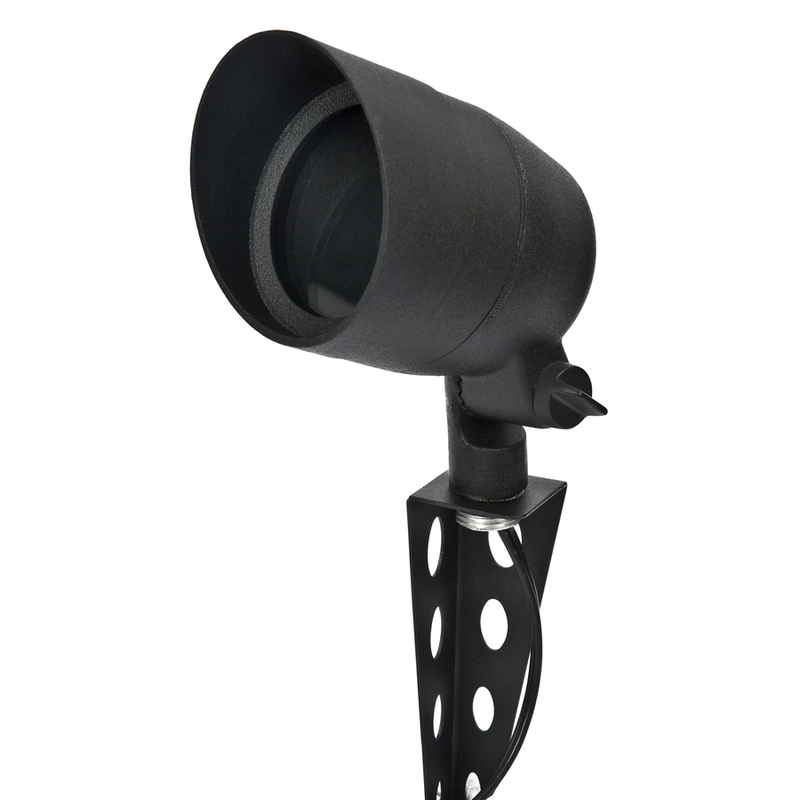 The only other purchase necessary is the electric lighting cable–I used 14 gauge cable. Now on to placement. Once I placed all the lights where I thought I wanted them, I attached the cable to the transformer box, then attached each light individually to the cable. This is really simple–each light has a connection box into which you thread the cable then screw down the lid, which pierces the cable and provides the connection. 5 minutes tops. Once all of the lights were connected, I plugged the transformer into the outside electrical socket and voila! I waited to bury the cable until the next day, so I could see how the lights looked once it got dark. 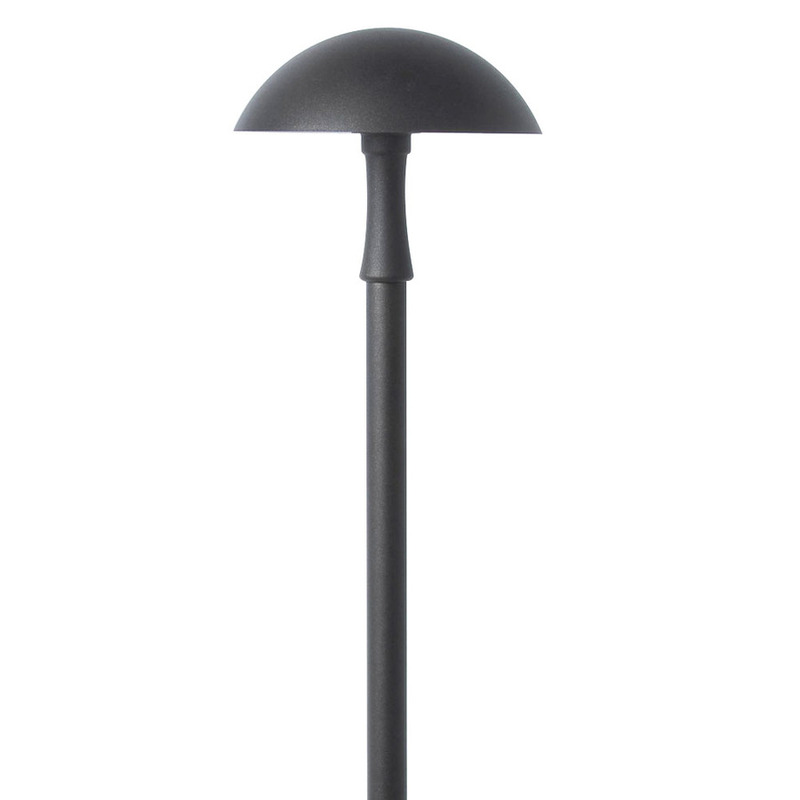 Once placement was finalized, I used a garden edger to cut a ½ inch trough into the grass and pushed the cable down into it. Any cable in the gardens was simply covered with mulch. 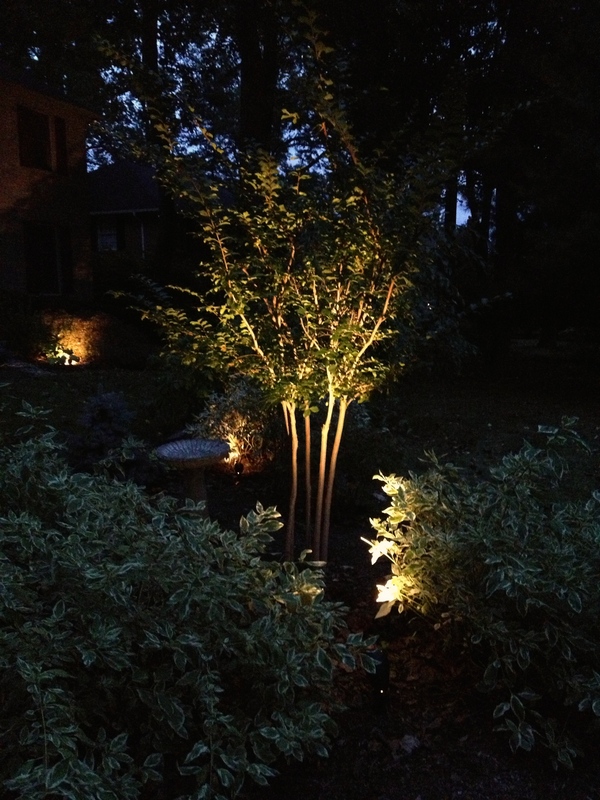 There are many benefits to low-voltage lighting. 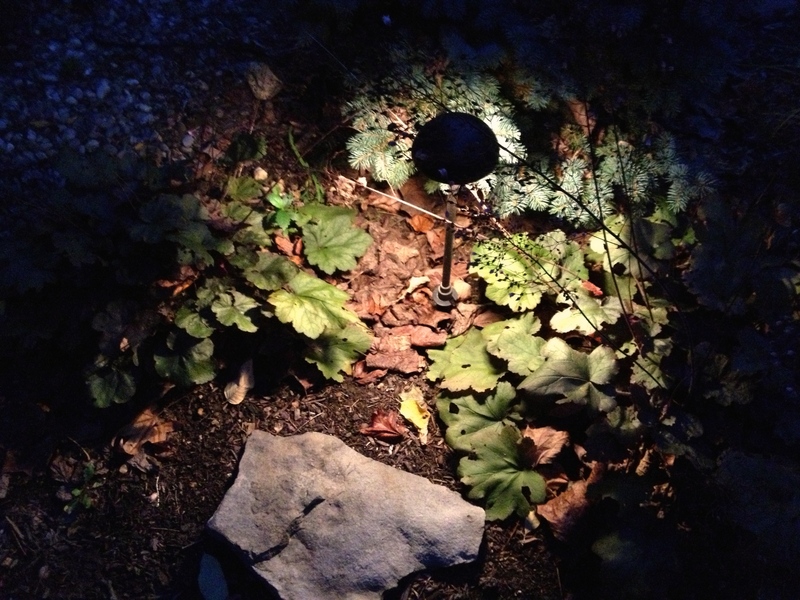 It has a stronger and warmer glow than solar-powered lights. The low-voltage halogen lightbulbs last forever. And since it runs on a 12-volt system, it is fairly cheap; I haven’t seen a bump at all in our electric bill. The transformer I used has a digital setting and an electric eye that detects light. The lights automatically turn on at sunset, and I simply set the number of hours I want them to remain on. This was a simple and economical way to add a lot of punch to our home and gardens. Try it and see! Great job! That’s exactly what I would like to do with the trees in the front of my house. I will consult your instructions and see if I can get as good an outcome.